it's #pancakesunday again! How are you today? 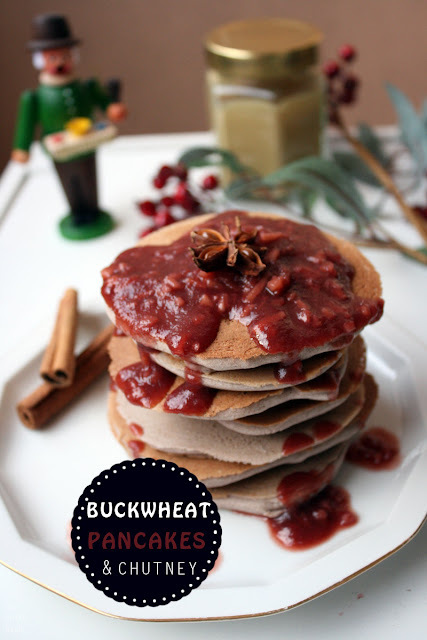 I'm feeling great because after a snug movie night with friends and a nice sleep in my boy and I started the day with this delicious stack of buckwheat pancakes. 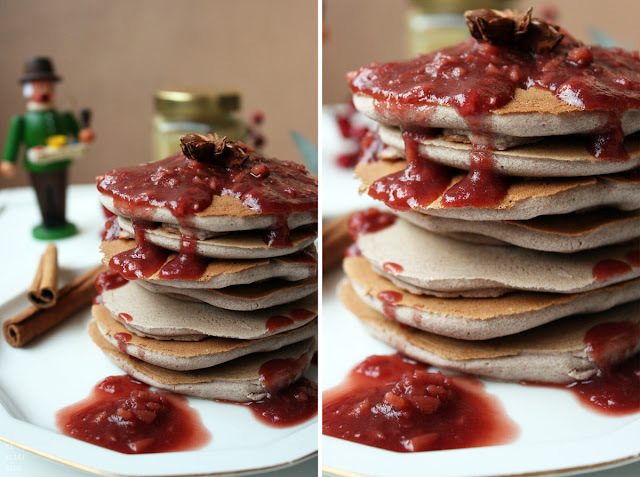 Buckwheat pancakes (blinis) are actually part of traditional Russian cuisine, but my version is vegan, gluten free and refined sugar free! I mean, how can you step a Sunday wrong when you start with a thick pancake stack like this? 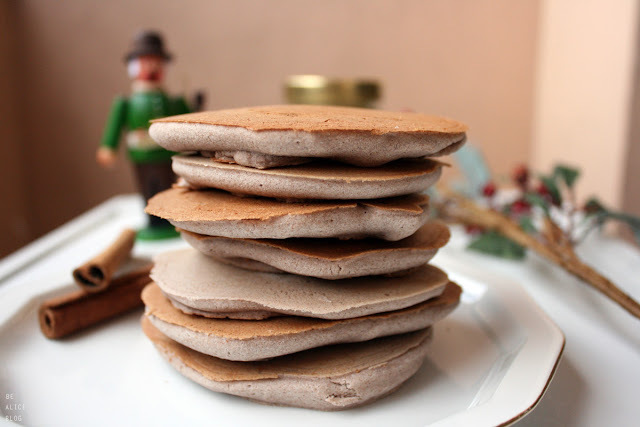 First, combine the ingredients for the pancakes in a mixing bowl and set aside in the fridge for 10 minutes. Cook them using this method. 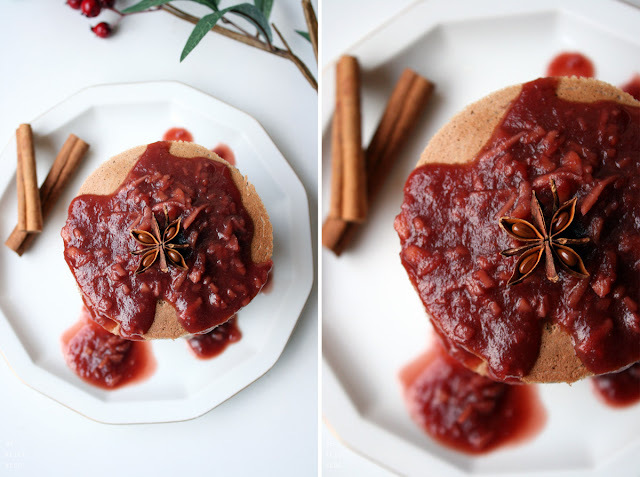 While the pancakes are cooking along nicely in your frying pan, prepare your apple ginger chutney! In a small frying pan, combine ginger and coconut blossom sugar and sautée over medium high heat until the ginger sugar mixture begins to bubble and get slightly golden. At that point add the remaining ingredients to the pan and stir, using a wooden spoon. Allow to simmer and reduce, stirring every now and then. This should take about 15-20 minutes. Don't forget about your pancakes though! 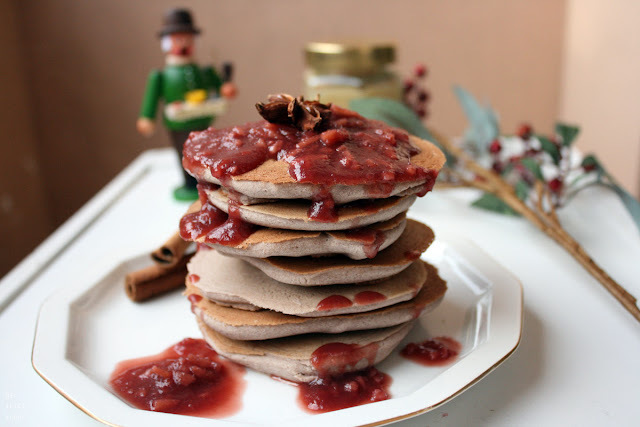 Once the pancakes are all nice and brown, and the ginger sauce is nice and thick, pile up your pancakes and drizzle with a generous amount of ginger sauce. As I was eating these beauties, I found out that pairing peanut butter and ginger sauce is the perfect marriage of sweet-creamy-fatty and spicy-tangy-fruity. Almost like PB&J, but with a zing!